The HCMH Auxiliary was officially formed in 1965 devoted to the goal of having a county hospital. Today, it is a vibrant, supportive organization for the hospital with a group of dedicated volunteers that give generously of their time, talent and labor. The auxiliary stays active with running Genevieve’s Place, a coffee and gift shop, providing atrium transport to our patients and guests and holding annual fundraising and membership events. Over the years the Auxiliary has raised over $500,000 that has been used to support the hospital. Membership continues to grow each year with dedicated volunteers that believe and support the hospital mission. Serve the community and support local healthcare. Use their individual skills and hobbies to help others. Spend vital time and resources with fundraising events as well as serving on Auxiliary committees. Attend our Annual Meeting/Appreciation Luncheon and Christmas Coffee to honor our Auxiliary members as well as volunteers. Meet new friends and establish relationships all while having fun! 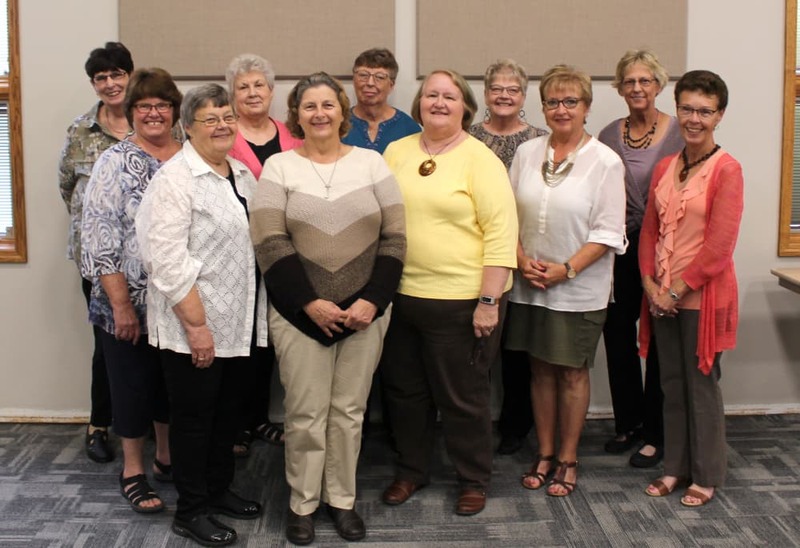 The HCMH Auxiliary Membership for 2018 is 467 members with 92 Lifetime Members that are included in this total. Annual Membership is available to those who pay annual dues of $10.00 or purchase a Life-Time Membership for $150.00. We want to express our appreciation to everyone that makes a donation to the HCMH Auxiliary, whether that is through a monetary donation, membership or purchases at Genevieve’s Place. The Auxiliary has a long and distinguished history of service and contribution to the hospital and your donation is invaluable to the overall growth of HCMH. The Humboldt County Memorial Hospital Auxiliary Scholarship Program awards $1,000 scholarships to area students enrolled in accredited health care education programs. To qualify, the student must be within two years of completing a health care education program (within one year of a two-year health care education program) and a Humboldt County High School graduate OR employed in a Humboldt County medical facility such as HCMH, medical clinic, dental office or care center. Scholarship recipients are awarded ($1000.00) per academic year with a maximum of ($2000.00) over two academic years. The student must reapply for the second year. Award recipients will be selected based upon academic achievement, leadership potential and desire to pursue a healthcare career. Scholarship applications may be downloaded here or picked up at the HCMH Reception Desk. For more information concerning the HCMH Auxiliary Scholarship Program, call 515-332-4200. Applications must be submitted by May 30th. Click here to view all awarded scholarships since 1974. This is the HCMH Auxiliary’s biggest fundraising event of the year! Every spring the HCMH Auxiliary hosts a 2 day $6 Jewelry Sale and Silent Auction. Silent auction items are donated by all hospital departments, local businesses and community members. We encourage everyone to attend this meeting to hear reports of your Auxiliary, elect the officers and board members for the upcoming year, and participate in other related items of business and information about the Auxiliary. The CEO also joins us and takes a moment to give us a recap on the wonderful things that HCMH is doing. Most of all, however, it will be a time to relax and enjoy food, fellowship and friendship. Please feel free to invite some friends who are not members of the Auxiliary. Prospective members are always welcome to come and share the day with us. We feature nice door prizes and the luncheon will be hosted by the Auxiliary board members. This festive membership drive consists of afternoon coffee, treats, shopping, door prizes and fellowship. Our members play a key role in the success of the Auxiliary and it enables them to help the hospital with vital purchases to provide our patients and residents of Humboldt County the best in healthcare. The HCMH Auxiliary sponsors Genevieve’s Place which is located through the hospitals main entrance next to the HCMH Outpatient Speciality Clinic and staffed by Auxiliary volunteers. Pre-packaged sandwiches, snacks, beverages, candy and gum are available as well as cards and gift items. Postage stamps and personal care items are also available for purchase by patients and guests. All sales from Genevieve’s Place is used to support the needs of the Humboldt County Memorial Hospital. Closed for renovation and will tentatively open Fall of 2019! Genevieve M. Carlson was a Century Farm Owner in Humboldt County and a life-time member of the Humboldt County Memorial Hospital Auxiliary. Genevieve’s wish was to have a snack bar for visitors, employees and residents of the hospital. Thanks to her generous donation, of $114,549 Genevieve’s Place is a welcoming addition to the hospital.